Greencastle Music Fest Veterans and Crowd Favorite, The Louisville Crashers, Celebrate Their Return This Summer. Greencastle, IN – Returning this year to the annual Greencastle Music Fest hosted by Almost Home Restaurant, are the Louisville Crashers. The energetic band is set to play at the Music Fest in downtown Greencastle on August 25, 2018. 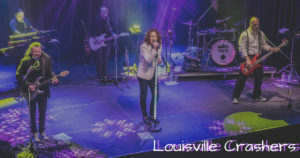 The Louisville Crashers are recognized as one of the greatest party bands in the Midwest and prove just that every time they perform in Greencastle. The band has made TV appearances with David Letterman, Jay Leno, and Conan O’Brien. They have also toured worldwide, sharing the stage with Blake Shelton, Kid Rock, Aerosmith, and Luke Bryan. The band has been playing together for 10 years and continues to perfect their sound. They constantly add new songs but are always ready to play fan favorites. Instead of having a defined set list for each show, the members allow fans to decide where the show goes by giving them the opportunity to request songs. The Louisville Crashers are currently on the road and performing all over the country, including a show in Colorado after the Music Fest. “We did not want to miss (Greencastle) Music Fest this year because everyone is so good to us, especially Gail (Owner of Almost Home Restaurant and Event Coordinator). She works so hard and has a great vision for this event and for Greencastle. Every community needs a Gail, she is an awesome woman” Lead singer, Mark Maxwell, said. This is not the group’s first time performing at the event. Over the past several years the band has formed a relationship with the town as well as the people. Maxwell said, “We love that the people in Greencastle appreciate us. It’s a fun event to play because we’ve gotten to know a lot of people and business owners in the area since we’ve performed here for several years now.” The people of Greencastle have also formed a connection with the band, one family named their child after the band. “I mean how cool is that to have a fan name their baby Crasher, and then we get to see him as he grows every year. He’ll be two this year, we can’t wait to see him there,” Maxwell added. The event is set to be bigger and better than ever with a larger stage, improved lighting and sound systems to enhance the overall experience. The festival will also feature a corn-hole tournament as well as a children’s game area. Greencastle Music Fest is a community music gathering that has been taking place in the streets of Greencastle, Indiana and is now in its 9th year. The event began as an anniversary celebration for local Greencastle restaurant, Almost Home, and is still hosted by the restaurant today. Almost Home is a restaurant located in Greencastle, Indiana and has been a staple in the community for 28 years. True to their name, the food served is comfort food at its finest, making customers feel as if they are “Almost Home”. In addition to the restaurant they have Swizzle Stick Bar, offer on-site private parties and cater many offsite events throughout the year. For more information about them, please visit their website at www.almosthomerestaurant.com.